Updated Tuesday morning, April 14, local time. 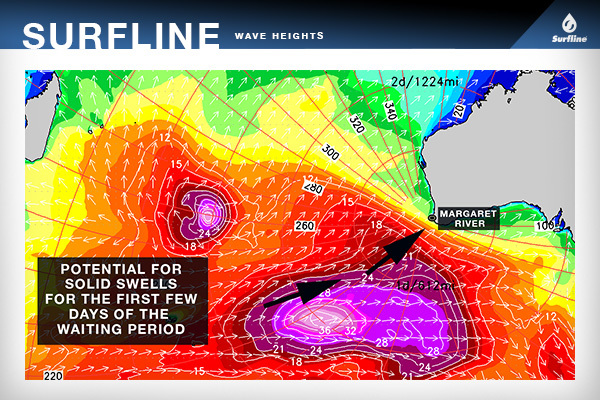 Peter Mel breaks down the Surfline forecast for the Drug Aware Margaret River Pro. Brief Overview: Very solid, back-to-back SW groundswells prevail on Wednesday and Thursday, easing a bit on Friday. Another very strong SSW groundswell looks possible for Saturday, and could be even larger than the surf for Wed/Thur. Morning wind conditions look favorable for the next few days, with some periods of side or onshore flow in the afternoons. Note: Surf sizes below are face heights and focused on Margaret River Main Break. WEDNESDAY 15th: Very solid SW groundswell (240-220 degrees). Swell/Surf: 12-20'+ faces with occasional larger sets. Very strong surf all day, but with a slight building trend from early morning to early afternoon. Wind/Weather: E/ESE wind 6-10kts in the morning, with a little leftover bump/morning sickness possible early from today's southerly wind. Wind trends to SE late morning and eventually SSE flow builds over the afternoon 10-14kts. THURSDAY 16th: Very strong SW swell (235-215 degrees) reinforcements rebuild into the afternoon. Swell/Surf: Very similar size to Wednesday, with a rebuilding trend into the afternoon with continued 12-20'+ faces and some occasional larger sets. Wind/Weather: E wind 5-10kts through the morning, trending to light/variable wind mid day before rising SSE/S flow later afternoon 8-12kts. SATURDAY 18th: Good potential for another very solid SSW swell (220-200 degrees) Swell/Surf: Current model guidance indicates that this swell will be as strong, if not stronger, than the swells for Wed/Thur. Stay tuned, this is dependent on storm formation and behavior in the next couple days. Wind/Weather: Moderate E wind in the morning, trending lighter ENE in the afternoon. Stay tuned. SUNDAY 19th: SSW swell looks likely to drop off through the day. Swell/Surf: At this point it looks like swell/surf will quickly drop through the day, although still be in the well overhead range. Wind/Weather: Building NNE wind possible. Stay tuned. Catch all the action LIVE at worldsurfleague.com from April 15-26, and on the go with the new WSL app.